Successfully Added Lenovo HW02 Fitness Tracker Bracelet - Pedometer, Sleep Monitor, Calorie Counter, Heart Rate Monitor, Bluetooth, IP67 (Black) to your Shopping Cart. With the Lenovo HW02 fitness tracker bracelet at your wrist, you’ll be able to reach your fitness goals in no time. This sophisticated sports tracker will coach you throughout your upcoming workouts to make sure you’ll train in the most efficient manner. With its heart rate monitor, you’ll be able to keep constant track of your current heart rate. Based on this information, you can adjust the intensity of your workout in order for it to meet your personal capabilities. Thanks to this, you will be able to train your body in an efficient and healthy manner. Whether you’re looking to increase your cardio, build muscle, or lose weight. This sports tracker is sure to support you throughout the process. 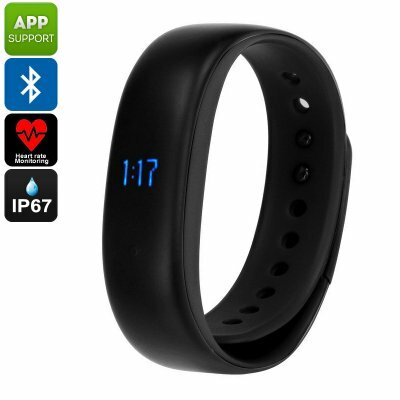 Besides its heart rate monitor, this fitness bracelet also comes with a pedometer. This fitness feature allows you to keep accurate track on the number of steps you took throughout the day. Additionally, it shows you the distance that you have covered and calories burned to make sure that you’ll always meet your daily exercise levels. In order to guarantee you won’t miss out on any workout, your sports watch comes with an automatic exercise reminder. Therefore, you’ll never have an excuse again to skip your daily training session. With its IP67 waterproof design, it can be used in any weather condition. With its Bluetooth 4.2 connectivity, your fitness band can be paired with both iOS and Android smartphones via the dedicated Application. When done so, you will be able to receive incoming call and message notifications straight onto the OLED display of your fitness accessory. Therefore, you can be guaranteed that you’ll never miss out on an important update again. Its 60mAh battery produces enough power to take you through 9 days of regular usage. Thanks to this, you won’t have to worry on daily basis about recharging your Bluetooth fitness tracker.